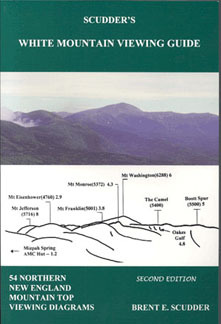 Scudder's White Mountain Viewing Guide, by Brent E. Scudder, 2nd edition, 2005. An indispensable guide for hikers who love their views. The book features panoramic sketches of the vistas from 54 summits across New Hampshire and just across the border in Maine, Vermont and Quebec, including over 25 in the White Mountains. Each sketch identifies dozens of peaks and other features visible from each summit, and even tells you how far away they are. Brief written descriptions accompany the panoramas. Interesting appendices include a formula for predicting excellent visibility. 368 pp, 6" x 9".